U-Force the controller accessory peripheral for the Nintendo NES. 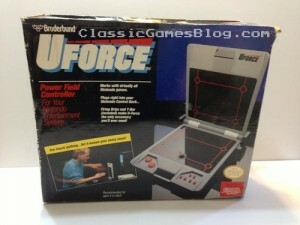 The U-Force (Uforce) is a controller that came out in 1989 for the NES by Broderbund. 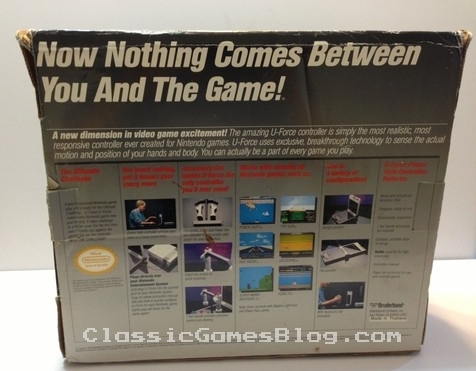 It was based on infrared technology that allowed the gamer to use hand and body motions (think of a 1980’s version of the Nintendo Wii only glitchy and problematic) to play games. A new dimension in video game excitement! 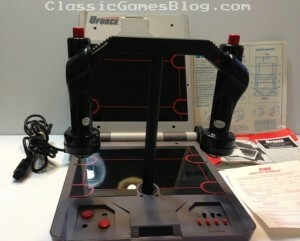 The amazing U-Force controller is simply the most realistic, most responsive controller ever created for Nintendo games. U-Force uses exclusive, breakthrough technology to sens the auction motion and position of your hands and body. You can actually be a part of every game you play. 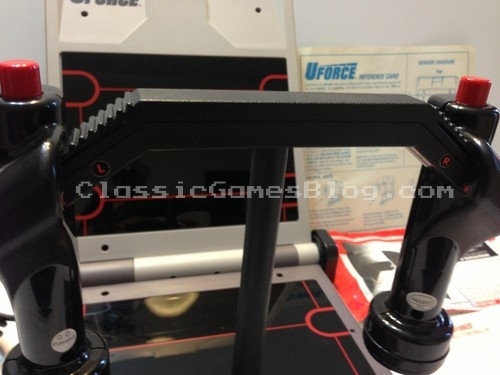 When you purchased the U-Force it came bundled with the unit itself, a “Power-Bar”, T-Bar, and Hand Grips. The Power-Bar was for Mike Tyson’s Punchout and “future games”. The U-Force unit could be setup in 3 different “positions”. The “Upright” position which looked like a conventional laptop, the “Upright position with accessories” (such as using the Power Bar to play Mike Tyson’s Punch-out) and the “Flat” position. 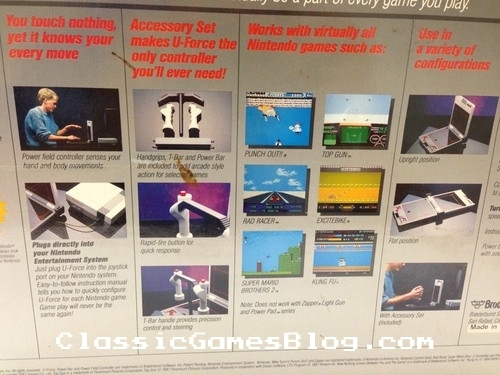 Some games played semi-tolerably with the U-Force but most were unplayable or they were immensely harder than using the standard NES controller. With this being the case it was hard to justify purchasing the U-Force unless you wanted to deal with the quirkiness of it. I hated the U-Force back in the day and I still don’t enjoy it even for “nostalgic sake”. It’s flaky and doesn’t live up to the promises stated. If you want to try it out on a game you’ve already mastered it might be fun for a few minutes but after that I’m sure you’ll get sick of it.